Jim Haynes is one of Australia's foremost entertainers, and a specialist in Australiana. In show 200629 which went to air in Sydney on 20/July/2006 and on Bluegrasscountry.org on the week of 12-19 August, we played a song by Jim called "Weelabarabak For Me". It's a fast-paced song with lots of references to Australian places and icons. There are many listeners to the show around the world who wont understand much of what was in the song, so for that reason I thought it might be helpful to put a translation on the web site. "I try to write music that captures people’s humanity - their quirks and their funny habits, but also their desire to do the right thing and make it all work out in the end." "My humour and satire are meant to be gentle, to make people laugh and feel good. 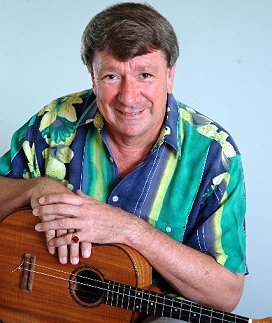 Jim Haynes is a specialist in Australiana, singing, writing and performing songs and poetry about the Australian lifestyle. This song will be a bit confusing to a lot of people who havent lived aroudn the Australian idiom for a while. So I thought I'd have a go at translating it for non-Australians to enjoy. Wombats and wallabies are Australian marsupials. Wagtails and Currawongs are birds. Is Weelabarabak a real place? Jim Haynes says so. His friend Greg Champion, who we've heard many times on the show says it's an aboriginal word meaning "place that's very hard to find". Weelabarabak for me. And if you can learn this song and do it at Jim's pace, you're a better person than me! I havent got a hope!